This was first posted sometime back in 2008, yet still I find myself periodically going back for the same yummy yam rice in Taman Chi Liung in Klang. 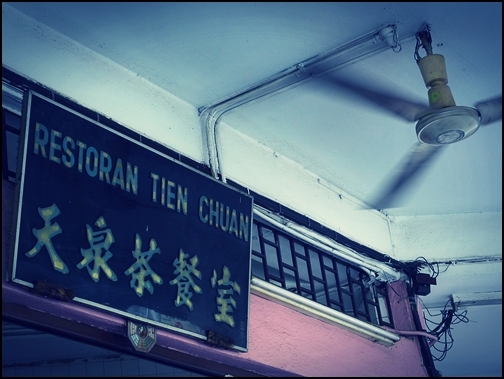 A corner coffee shop by the name of Restoran Tien Chuan, this outlet has been serving their patented brand of yam rice for more than 20 years. Of course, one may argue that to travel all the way down to Klang, and NOT having Bak Kut Teh (BKT) for breakfast is pure sin. Yeah, but once again (remember the post on Klang Food Centre’s pau for breakfast?) continuous BKT assaults not only can gain you some spare tyres, but I tend to feel lethargic throughout the day after such a darn heavy breakfast. At Tien Chuan, you know you’re in for some good grubs as the shop is perpetually packed on mornings, especially on the weekends. 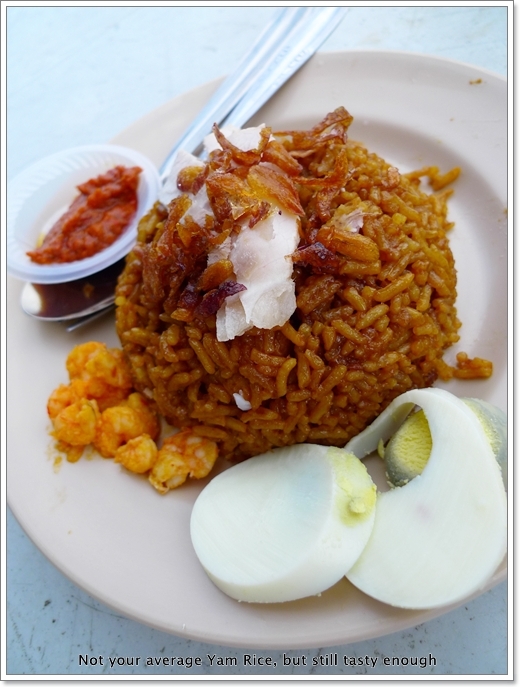 The Yam Rice is unlike the version commonly found up north in Penang. Tien Chuan’s version is cooked with larger cubes of yam, and served with a side of boiled dried prawns, slices of pork, half a boiled egg, and garnished with lots of fried shallots. The slightly pungent ‘sambal’ makes great condiment to the already tasty ensemble. The Nasi Lemak stall parked at the front of the shop screams for attention, especially when the whiffs of aromatic coconut milk reach one’s nose. Operated by a fairly affable Malay woman, you can have your plate of Nasi Lemak with her intepretations of sambal sotong (spicy cuttlefish), curry chicken, sambal kerang (cockles) and even curry mutton. 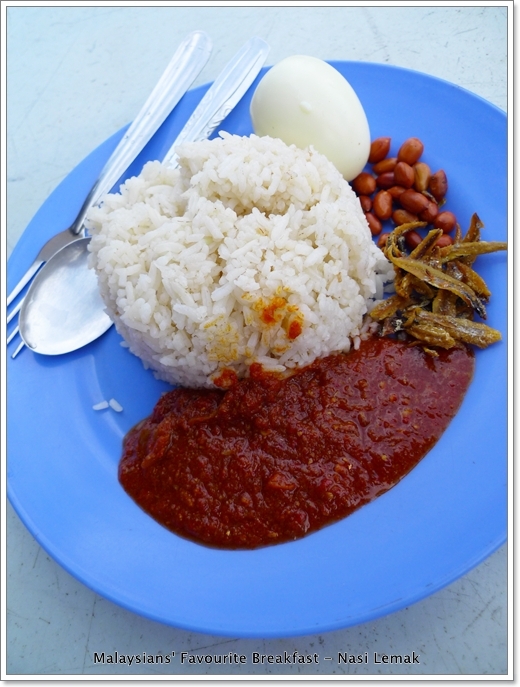 But her serving of Nasi Lemak Biasa (normal) with generous dollop of sambal on the side, with crunchy anchovies and peanuts always got the job done for me. Oh and she gives a WHOLE boiled egg, not half nor measly quarters. The Prawn Mee is also served by the same stall that sells yam rice, albeit none too memorable. Especially when your palate’s been pampered with Penang’s best. 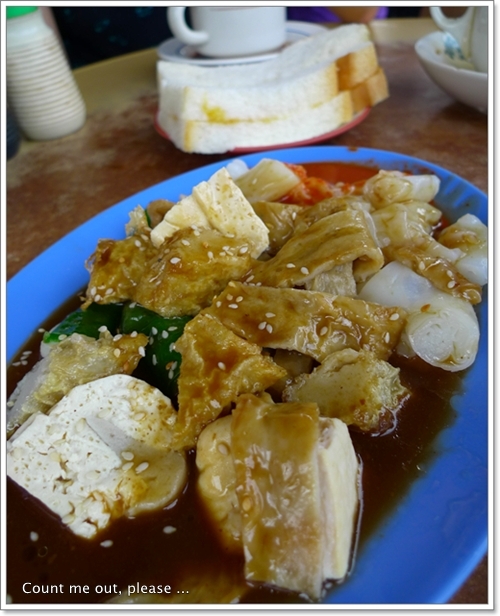 But I’ll skip the Chee Cheong Fun (steamed rolled rice noodles) served with Yong Tau Foo, for I can’t stomach the diluted sweet bean sauce (tim cheong), and the horrendous pieces of beancurd sheets (foo chook). 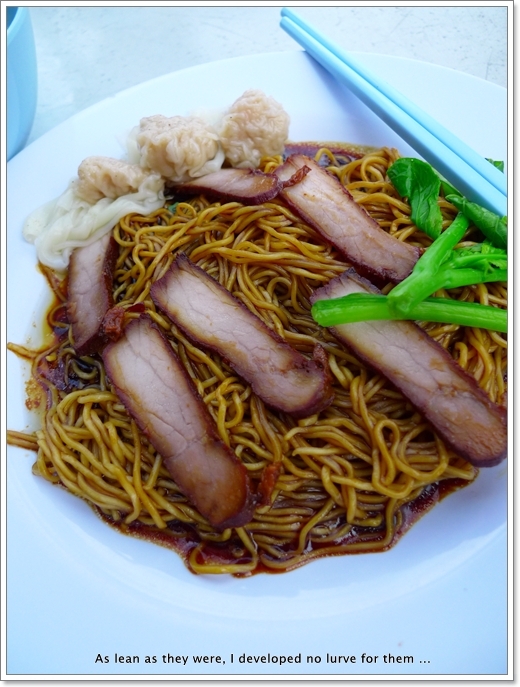 The Wantan Mee did not fare any better either. So I’ll recommend for you to stick to the yam rice, and maybe a plate of steamed bread with kaya/butter, and down them with a cup of thick, traditional coffee. Opens from 7.30am until 1.30pm. Here’s a GOOGLE MAP to Tien Chuan @ Taman Chi Liung, Klang. This corner coffee shop is very near to Taman Chi Liung’s morning market. So did you? Hehehe .. a little late in replying comments, sorry. 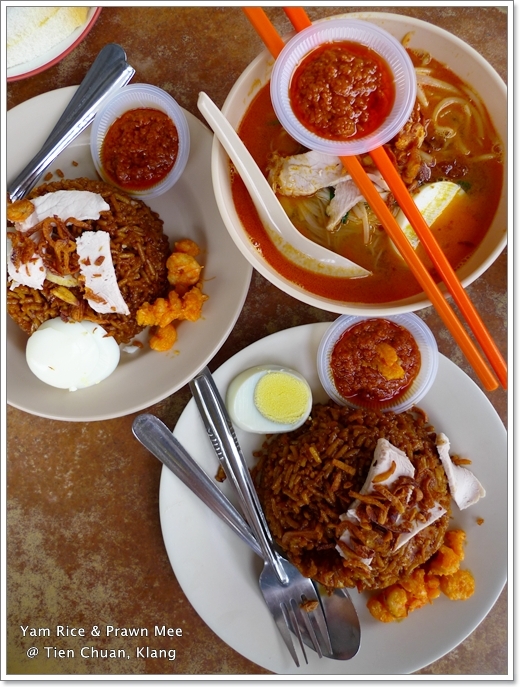 Though the photo of prawn mee looks good but I will take your words for yam rice when I find the place in Klang. TQ. You’re most welcomed. I dunno about the prawn mee, for I find that the broth lacked oomph, unlike Penang’s version. Though it was not really that bad in its own right. Hahaha …. sorely disappointed that I DO have them eh? Nice bumping into you guys. Hahaha .. most would have settled for the BKT again and again, until either you’re sick of eating heavy meals for breakfasts/brunches, OR you’re just seeking for something different. Erm, this one is unlike the northern version, really. Own intepretation, probably. For the yam rice, with sides of pork and prawns can be enjoyed on its own, with a dollop of sambal on the side. Patented yam rice eh? If only there was BKT on the side.. Indeed. Had it many times already, and still craving for more. Simple, yet tastes better than glutinous rice. The yam rice looks like a hybrid of the prawn noodles (with the shrimp on the side and sliced eggs and sliced pork) on top. But anything with shrimp and sambal I am sure it’s very good. Trust me there are few BLOCKS of yam inside there, hidden buried under the mass of rice. The side dishes of the yam rice seem like not very match with it lor…. Looks like it but actually not bad one. The soft boiled tiny prawns and the slices of pork go rather well with the yam rice. Hmm… this is interesting. It’s a rather unique way to serve yam rice. I’m sure it came from the Hokkien Mee stall right? Yeah they’re from the same stall. I love mahh yam! esp yam rice of which I’m a sucker for whenever I eat BKT. Prob one of the reasons why I dont eat BKT in KL. No yam rice and no meatballs, etc. Hummprh. But yea, the yam rice here looks really good!